NILS Ski Wear had the pleasure to be featured in Ellis Brigham Mountain Sports 2017 winter guide, white book. NILS Simplexity Collection, featuring the Kassandra Real Fur solid color hip length jacket in 4-way stretch layer fabric. With customer silver hardware. NILS Winter Fjord Collection, featuring the Ula 2 color hip length jacket in a satin like fabric combined with a 4-way stretch 3 layer fabric on the sides. With customer silver hardware. #FLASHBACK FEATURE Garage Grown Gear lists the NILS One Piece snow suit on its ranking of Top 10 best one piece snow suits of all time. They credit NILS for being on ski fashion trends year after year! Check out the JANS video review of the NILS Carolyn Jacket. The video beautifully captures all of the functional amenities of this stylish jacket! The NILS Lara Jacket in Pewter, tested in Utah and Chicago, passes the Snowgrrl review with flying colors! 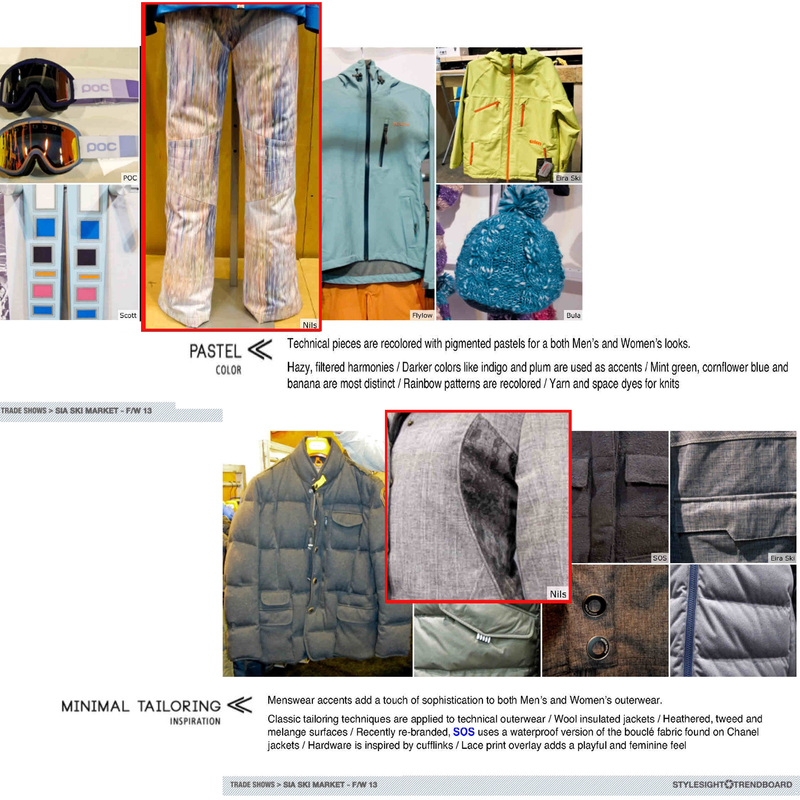 Read how the jacket demonstrates high performance on the slopes and on the streets in the article posted on Snowgrrl. Athlete Ambassador Kendall Fischer picks her 20142015 Ski favorites on Jans.com. The article features a detailed review of the Betty Pant, Terri Jacket, Lindsay Legging, and Robin Top. Her NILS favorites keep her cozy on the ski slopes, but also ready for après ski! Snowgrrl describes NILS as the holy grail of activewear for the modern woman in the detailed review of the Mariska jacket. Check out the article to see how you too can feel like an Ice Princess when you sport the Mariska jacket this winter! Snow Show Daily features the Cheri Print fleece and the Lindsay Print legging in eggplant marble. Check out the article that describes new organic fashion trends and the NILS pattern design process! SNOW Magazine gives the NILS Ingrid jacket the green light for the slopes this winter. 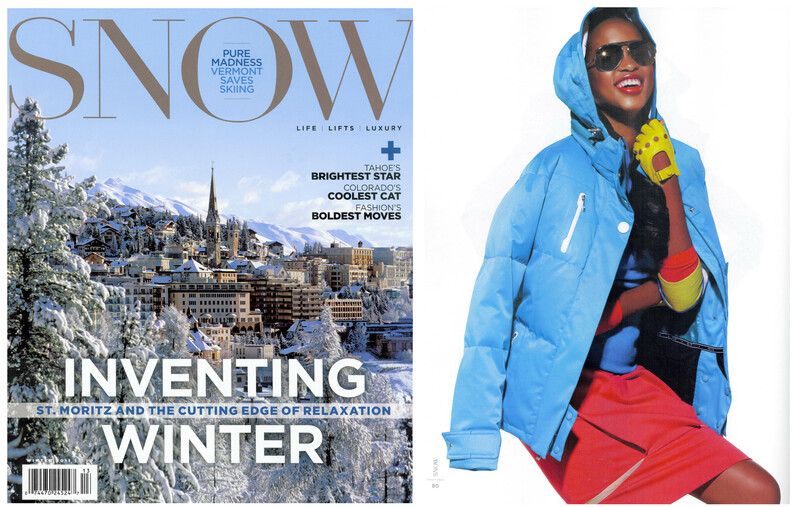 The fashion editors chose the citrus green jacket to represent the snow style of the season! 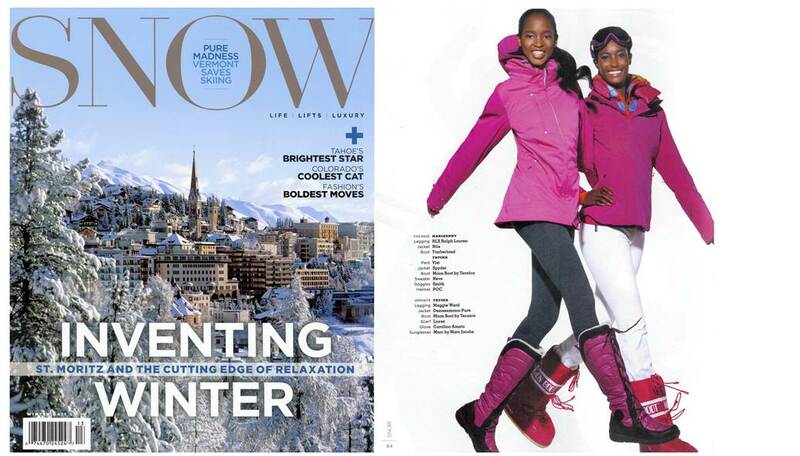 The NILS Carolyn jacket is deemed RED HOT in the SNOW Magazine feature for snow style of the winter 1415 season. Rev your engines on the slopes in the stylish stand out jacket! 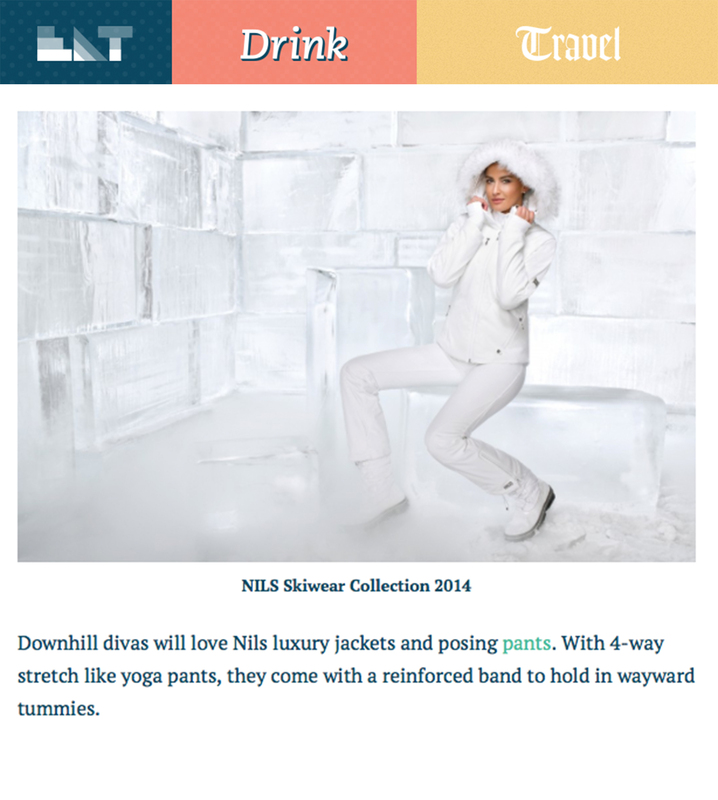 The NILS 2014 Collection makes Eat Drink Travel's Christmas Gift Guide! They know that any downhill diva will love posing in the NILS collection. The Erica Top and the Blaine Pant make the Houston Chronicle's Must-Have Gear for the winter season list. The comfy lace print set is given praise for the 99 recyclable Tencel fabric made from eco-friendly wood pulp cellulose! All about the stretch!! 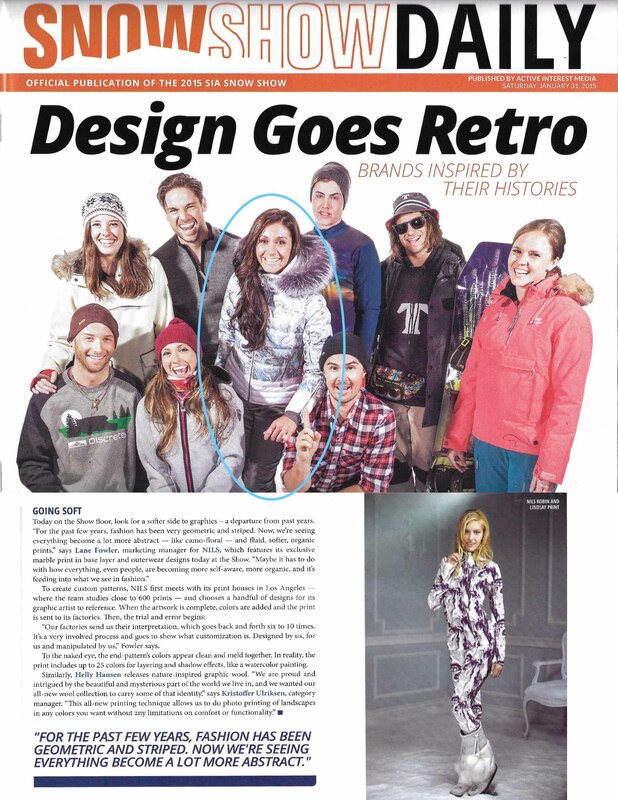 The Leah jacket and lane pant were featured on CHRON.com as one of the editors picks for ski fashion and performance. Follow link for the whole story. 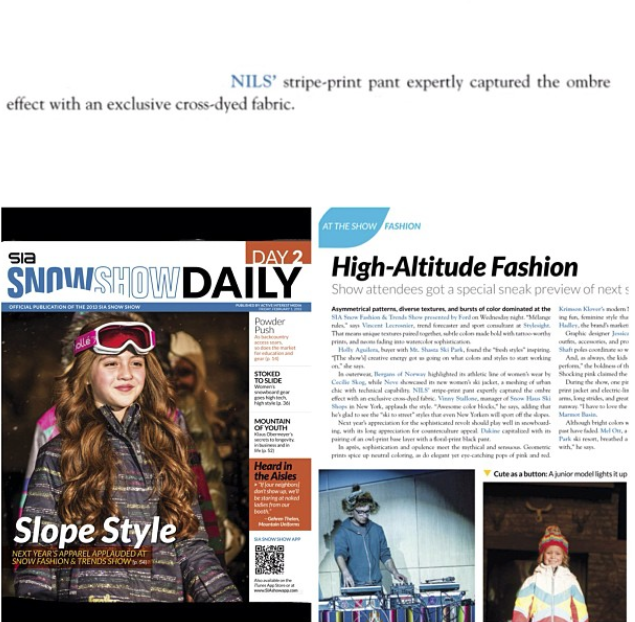 Stylesight Trendboards feature NILS skiwear from the 2013 SIA Show! The Dominique pant in Scandinavian stripe is shown as a trend for pastel colors. While the Hanna Lace print jacket is shown as a trend with minimal tailoring that adds menswear accents to Women's outerwear. Read more in the Stylesight article. The blog, Bonjour Colorado, outfits a ski look that isn't complete without the Annalise insulated stretch ski pants! Check out the rest of the look on the blog. 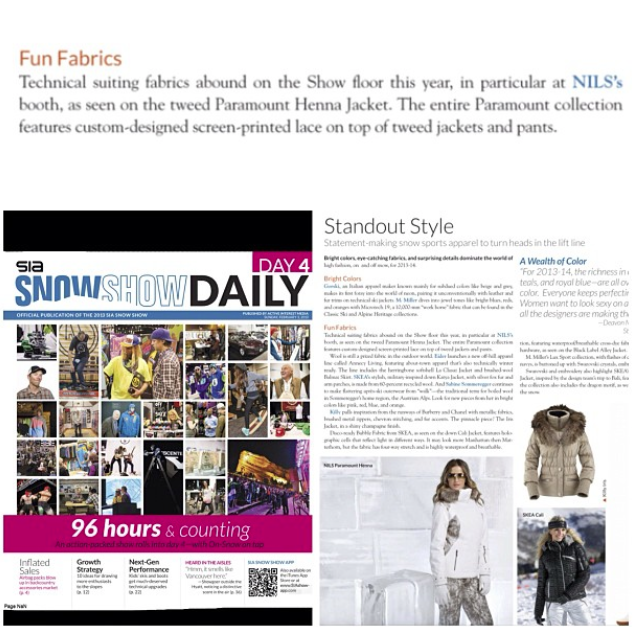 The Examiner has you covered on NILS at the SNOW Fashion Show NYC 2013. The NILS model rocks a bathing suit and the Kristin Jacket in Scandinavian Stripe! The blog, Tracy's New York Life features NILS in the article Skiwear for the Fashionista. She gives special acclaim to the lace printed base layer and the Amelia Jacket! 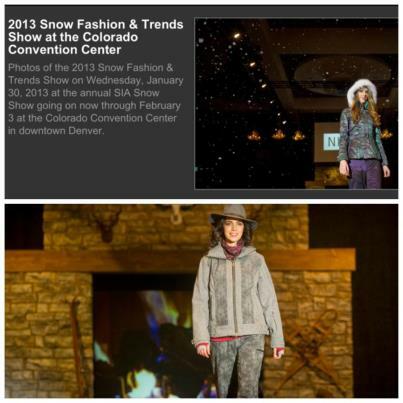 NILS featured in the 2013 Snow Fashion and Trends Show at the Colorado Convention Center. NILS Alley Ombre Jacket and and Ashleigh Black Linen Lace styles walked the runway at the annual SIA Snow Show! The Advice Sisters give a very detailed account of three luxurious NILS layers on their blog. You can chase your chills away with the Andrea Geo Print Jacket, the Ciaran sweater, the Gillian Lace print lightweight v-neck and the Elvia lace print pant. The NILS Dominique Pant in Scandinavian Stripe, featured in the article High Altitude Fashion, receives praise for expertly capturing the ombre effect with an exclusive cross-dyed fabric. The Standout Style article in SIA Snow Show Daily features the Hannah Jacket in whitelinen lace. The NILS Paramount collection is particularly mentioned for its custom-designed, screen-printed lace on tweed jackets and pants! 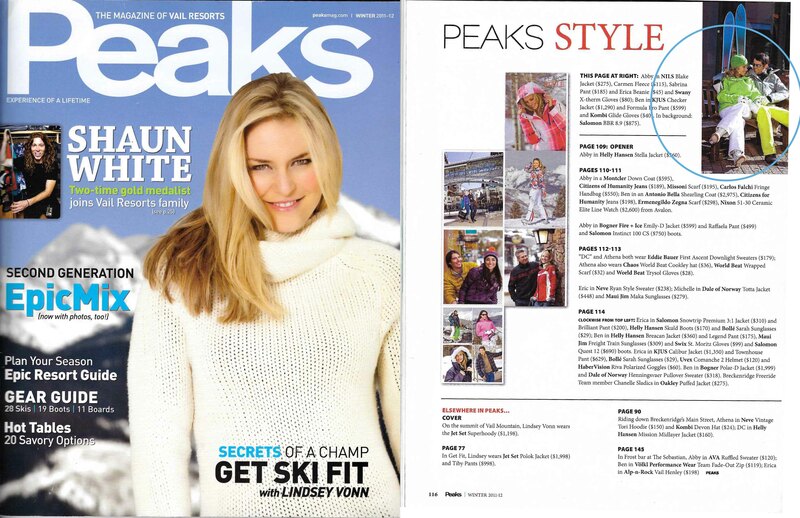 The NILS Blake Jacket, Carmen Fleece, Sabrina Pant, and Erica Beanie make a complete look in PEAKS Magazine! In the feature she bundles up next to her man while looking great in head to toe NILS. 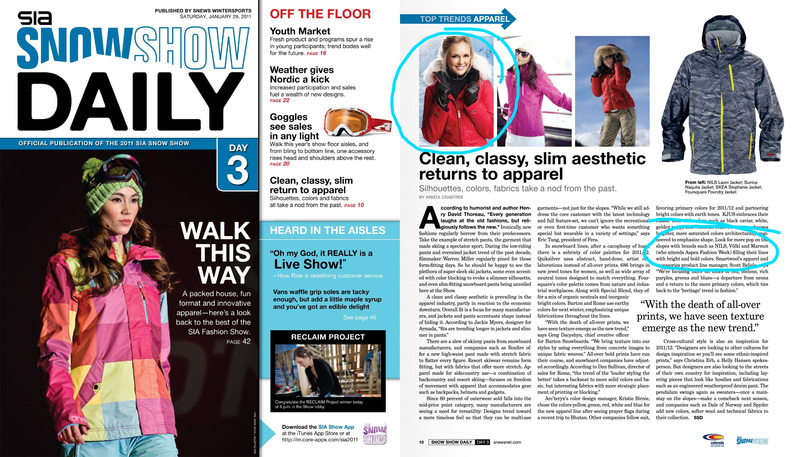 SNOW MAGAZINE kicks off the season with their Bright Turns article which hightlights the Shelli Jacket in Turquoise! 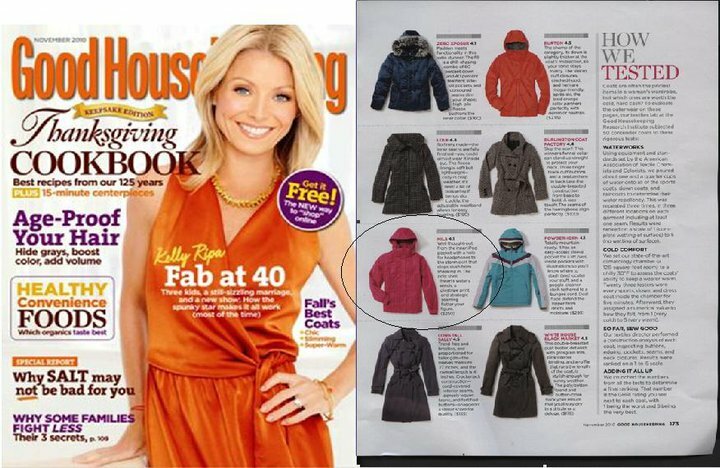 See the NILS Emily Jacket in Berry Pink featured in the new Winter 2011 issue of SNOW Magazine. 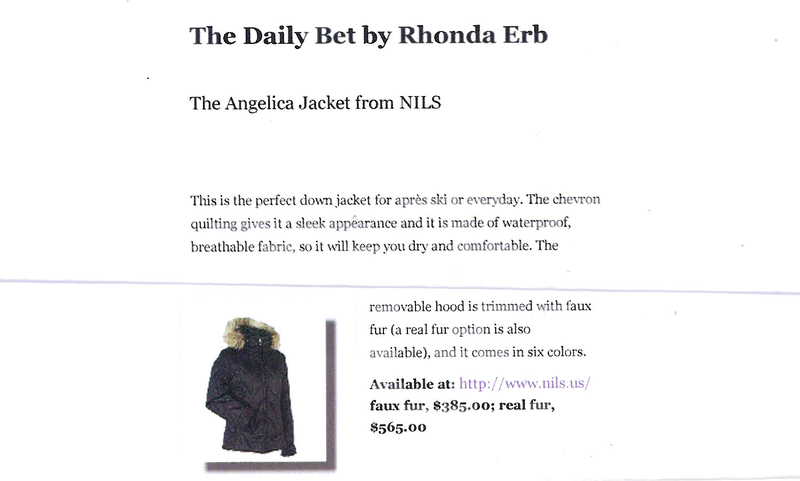 LYRA MAGAZINE has some nice things to say about NILS 20112012 line! We met up with LYRA MAGAZINE, an online gear and product review expert at the SNOWBiz media event in NYC this summer. LYRA had some great things to say about the NILS 20112012 line. Take a look! 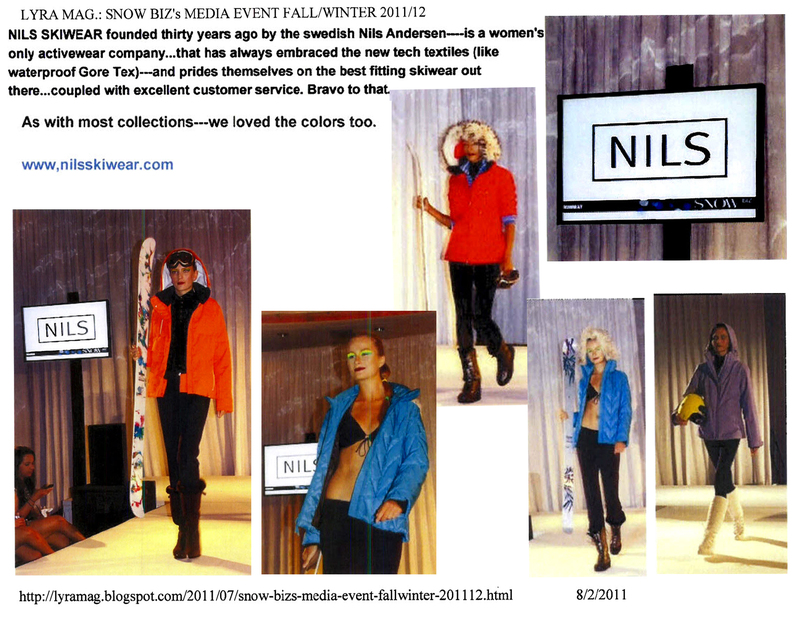 NILS models hit the runway at a SNOW Magazine media event in NYC. The mid-summer SNOWBiz runway show boasted beautiful models in bikinis and skiwear?! 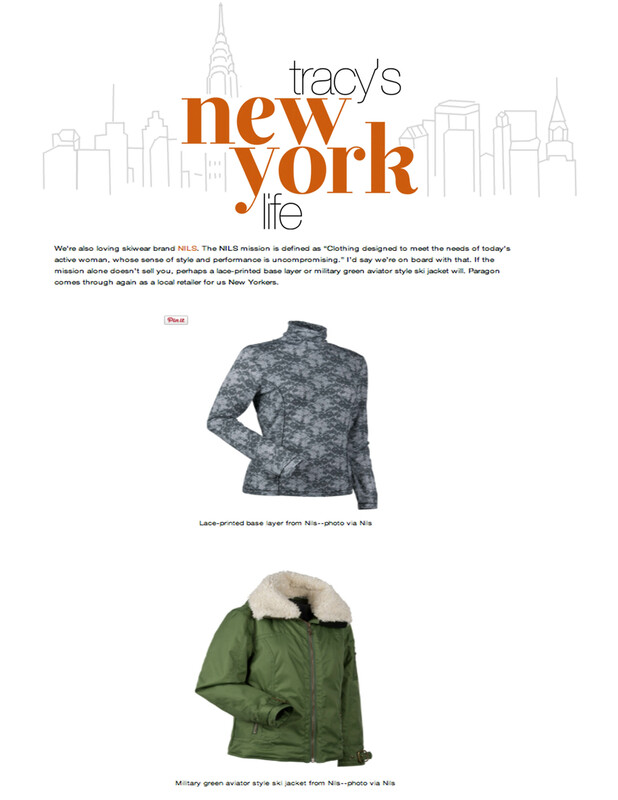 The Wall Street Journal picked their favorites from the show and the NILS Angelica down jacket in teal was one of them! The Ski Channel features a clip of NILS Design and Merchandise Manager Aimee Jacobs breaking down two new looks from NILS for Winter 20112012. Clink the link to see the inspiration for our Collective and Sport lines! The NILS Laoni Jacket, previewed from the 201112 line was featured as one of the favorites in the show daily in the Clean, Classy, Slim aesthetic returns to apparel story. Look for the Laoni Jacket and its Classy Counterparts in stores Next Fall! The article features SNOW A la MODE fashion show held at Paragon Sports in downtown Manhattan. The Newest and Hottest snow styles were invited to kick off the 2010 Winter season, including NILS. Here are some featured photos! 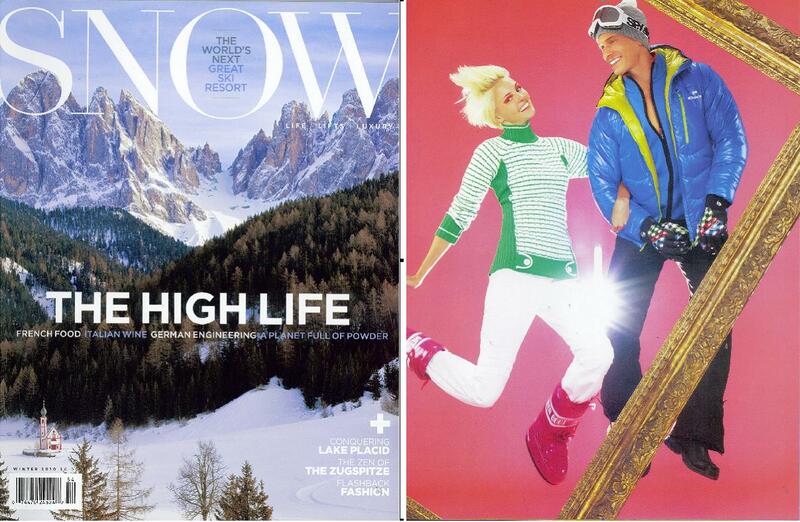 The NILS Whitney Sweater from the 20102011 collection Shown Here in Kelly Green was featured in SNOWs Pop Art Piste Fashion Shoot. We LOVE the bright colors! 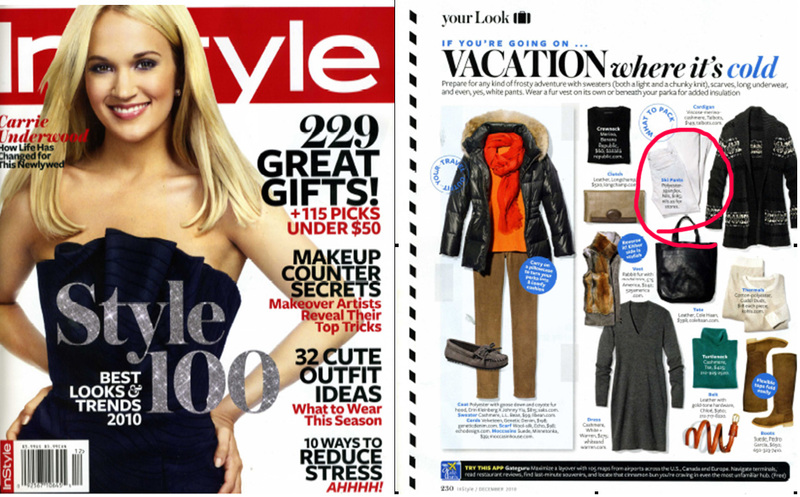 The Margie Insulated with Stretch Pant is featured in the What to Pack Story of the December 2010 issue of InStyle Magazine. The White Margie pant was declared a MUST if you are going on a snowy vacation! Good Housekeeping ran a story featuring Fall's Best Coats and the Grace Jacket withstood rigorous waterproof and warmth testing to be featured as one of the top 8 favorites for the year. Fit, Fashion, and Functionality!